As I said a couple of days ago, the media, and especially the ABC’s Chris Uhlmann is standing up to Bob Brown. Normally, the ABC treats him, as a journalist said, with the respect due to an Anglican Bishop in the 1950s. 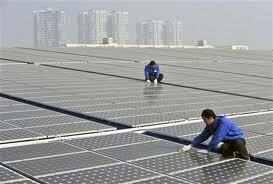 China produces half the world’s solar panels and installs barely 1 per cent of this green technology in its own country … Lomborg points out, its factories are chugging along, producing and exporting the panels to Western nations that hand out huge subsidies to its people who get to feel good about being green by sticking some panels on their rooftops. … whether we should really be getting excited about China’s green-friendly policies given that wind power accounts for 0.05 per cent of its energy needs and solar power generates one-half of one-thousandth of 1 per cent of China’s energy. Don’t expect much honesty in the debate on carbon taxes or from the extravagantly paid propaganda team of Tim Flannery and will Stephan and their Climate Commission troupers. Andrew Bolt has also been busily exposing their latest lies and scare campaign. This entry was posted on May 24, 2011 at 23:46 and is filed under Uncategorized. You can follow any responses to this entry through the RSS 2.0 feed. Both comments and pings are currently closed.